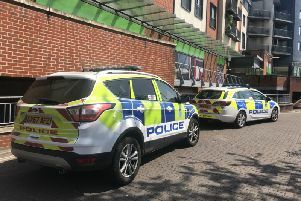 A woman has been arrested on suspicion of stealing a car after police stopped a vehicle outside a Horsham theatre. Police stopped a car along North Street, outside the Capitol theatre, at about 2.45pm this afternoon (Wednesday May 30). Officers said the car was believed to have been stolen. A 41-year-old woman, from Crawley, was arrested on suspicion of theft of a car.